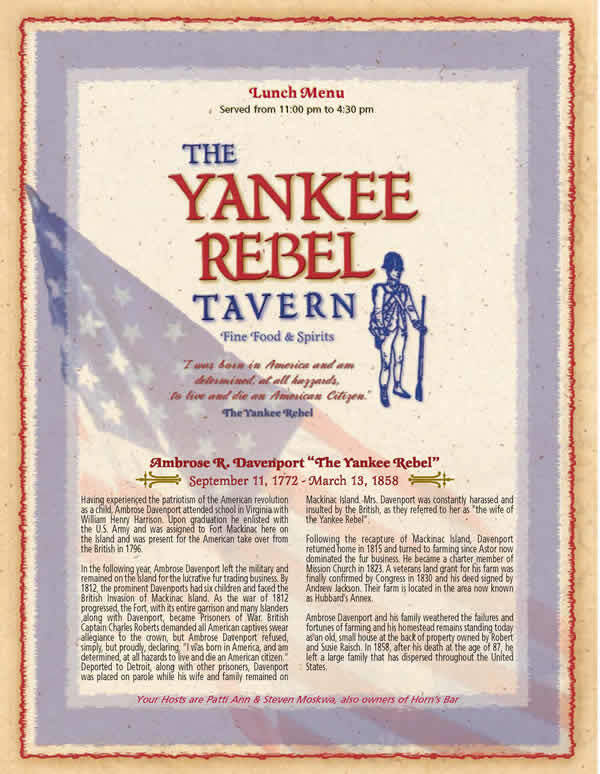 The Yankee Rebel restaurant is located on Astor Street in the heart of downtown just a short walk from all boat lines, churches and most lodging facilities. 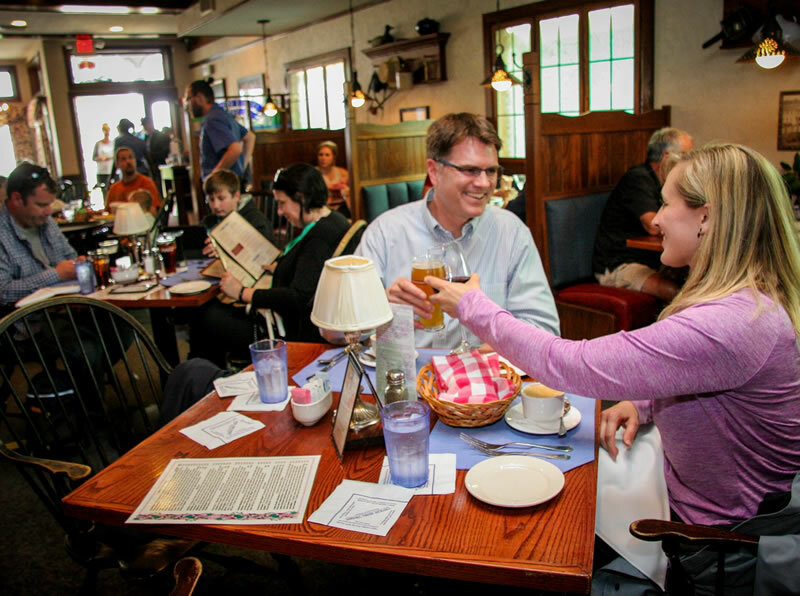 The restaurant has spacious seating with choice booths or large tables for gatherings of family and friends. We also offer fireplace seating for romantic dinners. 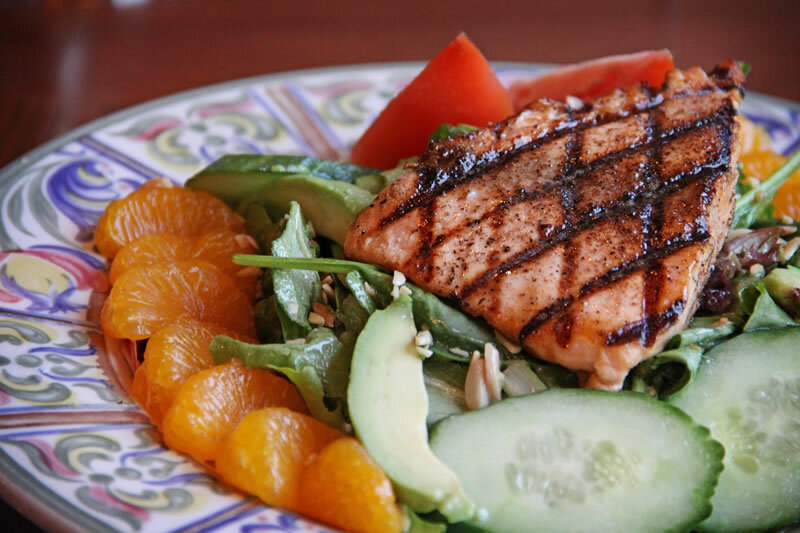 View our Lunch and Dinner Menus. 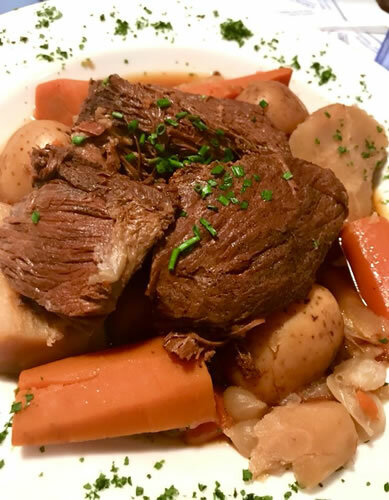 The Yankee Rebel is open daily for lunch and dinner offering an eclectic choice of regional favorites of appetizers, soups, entrées and desserts for your dining experience. We welcome families and offer a children's menu for both lunch and dinner. 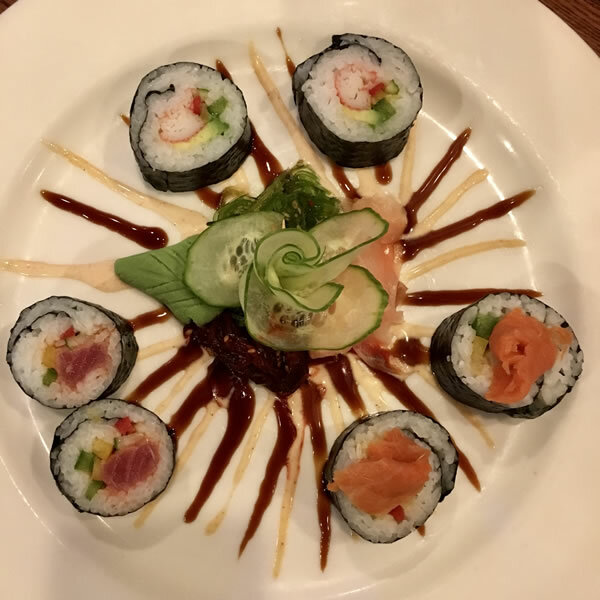 We also feature special sushi dinners! The Yankee Rebel caters to small or large family celebrations—weddings, rehearsals, family reunions or an intimate anniversary dinner. Contact us. "I just wanted to take the time to let you know what a wonderful dining experience we had last week at the Yankee Rebel. My husband and I took a 4 day trip to Mackinac Island to celebrate our 25th wedding anniversary. I read great reviews online about the Yankee Rebel, so we decided to give it a try and we are so glad we did! We had lunch there the first day and were lucky enough to have Danielle as our server -- she is exceptional and you are so lucky to have her representing your fine establishment! I had the Walnut Summer Salad which was excellent, and my husband had the Cowboy Burger which he said was also very tasty! It was such a great experience, we came back the next night for dinner, requested that we be seated at one of Danielle's tables, and tried your incredible Pistachio Crusted Michigan Whitefish followed by Crème Brule which were both awesome! I wrote a glowing review on Trip Advisor but I also wanted to let you know personally how pleased we were with the Yankee Rebel and also with Danielle! 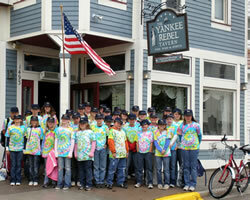 We live in Chicago and hope to visit Mackinac Island again and we will definitely be sure to eat at the Yankee Rebel!" "Thank you once again for your gracious hospitality and terrific food! The kids are parents were very happy and enjoyed the restaurant. Looking forward to next May! Enjoy the rest of your season! "Thank you so much for the excellent service and food the night of our wedding. People could not stop talking about the awesome food and exceptionally warm experience we had, due in no small part to your grace and professsionlism. We could not have asked for a better reception dinner. We hope to be back for many future meals! Thank you again." View photos of the Lilac Festival parade!